Following the international success of local writer Shin Kyung-sook’s novel “Please Look after Mom,” another powerful work of fiction about a Korean family is drawing attention. 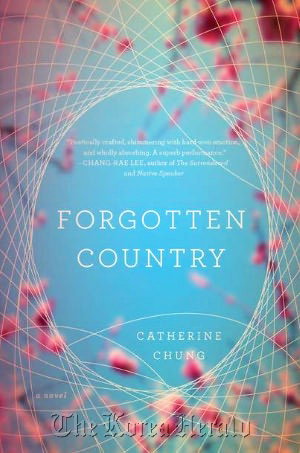 Korean-American author Catherine Chung’s engrossing debut novel, “Forgotten Country,” tells the story of two sisters born in South Korea. They move to Michigan in the U.S. as young girls, following their parents who try to escape Korea’s turbulent political situation in the 1980s. Meanwhile, Janie’s father is diagnosed with terminal cancer, and decides to move back to Korea, where he thinks he has better treatment options than in Michigan. Janie eventually traces Hannah down in California, where she has been attending UCLA unknown to her family, and tells her their father is severely ill.
Janie blames Hannah for their father’s illness, arguing her selfish behavior and disappearance caused him enormous stress and eventually triggered the fatal tumors. When Hannah calls her argument ridiculous, Janie lies to her out of resentment ― that Hannah is no longer needed in the family, and therefore she doesn’t need to come to Korea to see their dying father. Along with this engaging narrative, Chung deftly unfolds the family’s dark secrets and painful history ― which consists of murder, experiences of racism and difficult losses. Chung’s use of Korean folklore ― including the one of Simcheong, a filial daughter who gives her life for 300 sacks of rice to save her blind father, as well as the story of foolish frogs who bury their mother in the ocean ― effectively complement the complex theme of the novel. Both of the sisters in the novel ― Janie and Hannah ― are flawed and almost unlikable. Yet Chung offers a convincing portrayal of the people who are conflicted between two very different cultures while dealing with difficult family history. Catherine Chung was born in Evanston, Illinois, and grew up in New York, New Jersey and Michigan. She studied mathematics at the University of Chicago and continued her studies at Cornell. She currently lives in New York City.